TenguLife: The curious guide to Japan: The Third French Republic of Ezo, 1869 - 1870, Japan. The Third French Republic of Ezo, 1869 - 1870, Japan. The Third French Republic is generally considered to have been established in Paris in 1870, and reaching a conclusion in 1940 after a short disagreement with its neighbour, Germany. 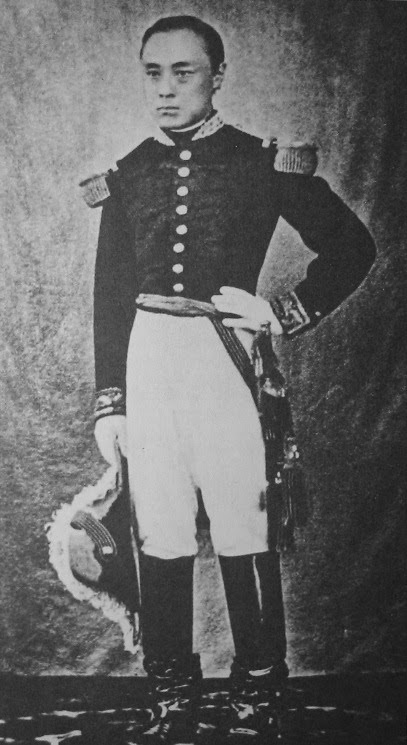 However, this was arguably the Fourth Republic, the Third having been established on the island of Ezo, today more commonly known as Hokkaido, in northern Japan under a commander by the name of Captain Jules Brunet. Granted he used a Japanese vassal as the face of the new country, but there appears little question, it was a Frenchman pulling the strings. The origins of this short-lived Republic had its roots in the final days of the Japanese civil war (The Boshin War) as the Tokugawa Shogunate collapsed and surrendered to the forces of the Emperor. Admittedly the Emperor didn't have much to do with this, being little more than a puppet for the cause of the western Daimyo himself at this point. In 1867, recognising the inevitable, Tokugawa Yoshinobu abdicated power, withdrawing to his lands in Shizuoka, west of Tokyo and essentially went on permanent gardening leave until his death in 1913. For the commanders of his forces and their French military advisors though, this wasn't the end of the issue. Fleeing to Ezo under the leadership of Tokugawa's naval commander, Admiral Enomoto Takeaki, along with several thousand troops and the final loot from the national treasury, the remaining retainers established their position in Hakodate. In an uncanny replay of the power arrangements between the Emperor and Shogun of the last 250 years, Enomoto petitioned the Imperial Court for recognition of the new Republic of Ezo, with himself as President, whilst Brunet directed military activity from the wings. The petition was summarily rejected and forces dispatched to retake the islands. Brunet fled by French warship and Enomoto taken prisoner, though later rehabilitated. And so ended the short-lived and little-known Third French Republic of Ezo, 1869 - 1870. Vive Japon!